Simon & Schuster, 9781451665444, 288pp. What happens to our society as a whole when smart, high-achieving young women are honing their traditional homemaking skills? Emily Matchar offers a smart investigation into this return to domesticity. Amid today’s rising anxieties—the economy, the scary state of the environment, the growing sense that the American Dream hasn’t turned out to be so dreamy after all—a groundswell of women (and more than a few men) are choosing to embrace an unusual rebellion: domesticity. A generation of smart, highly educated young people are spending their time knitting, canning jam, baking cupcakes, gardening, and more (and blogging about it, of course), embracing the labor-intensive domestic tasks their mothers and grandmothers eagerly shrugged off. Some are even turning away from traditional careers and corporate culture for slower, more home-centric lifestyles that involve “urban homesteading,” homeschooling their kids, or starting Etsy businesses. They’re questioning whether regular jobs are truly fulfilling and whether it’s okay to turn away from the ambitions of their parents’ generation. How did this happen? And what does it all mean? What happens to American culture as a whole when our best and brightest put home and hearth above other concerns? Does this sudden fascination with traditional homemaking bode ill for gender equality? What role have the media and blog culture played in making domesticity look so darn appealing? 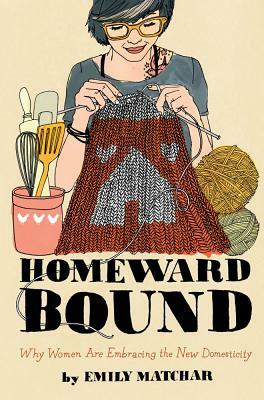 In Homeward Bound, acclaimed journalist Emily Matchar takes a long, hard look at both the inspiring appeal and the potential dangers of this trend she calls the New Domesticity, exploring how it could be reshaping the role of women in society and what the consequences may be for all of us. In riveting interviews with all kinds of people from coast to coast, Matchar examines the motivations of those who have embraced this movement, from Southern food bloggers to chicken-keeping “radical homemakers” on the East Coast to Etsy entrepreneurs in Provo, Utah, to attachment parenting devotees in Chicago, and many more. This groundbreaking reporting on the New Domesticity is guaranteed to transform our notions of women in today’s society and add a new layer to the ongoing discussion of whether women can—or should—have it all. Emily Matchar writes about culture, women's issues, work, food and more for places such as The Atlantic, The Washington Post, Salon, The Hairpin, Gourmet, Men's Journal, Outside, and many others. She lives in Hong Kong and Chapel Hill, North Carolina, with her husband. "Cogently argues that choosing a more hands-on, DIY lifestyle family farming, canning, crafting-can, without sacrificing feminism's hard-won gains, improve on an earlier time when 'people lived more lightly on the earth and relied less on corporations, and family and community came first.'" "An entertaining and well-structured book."